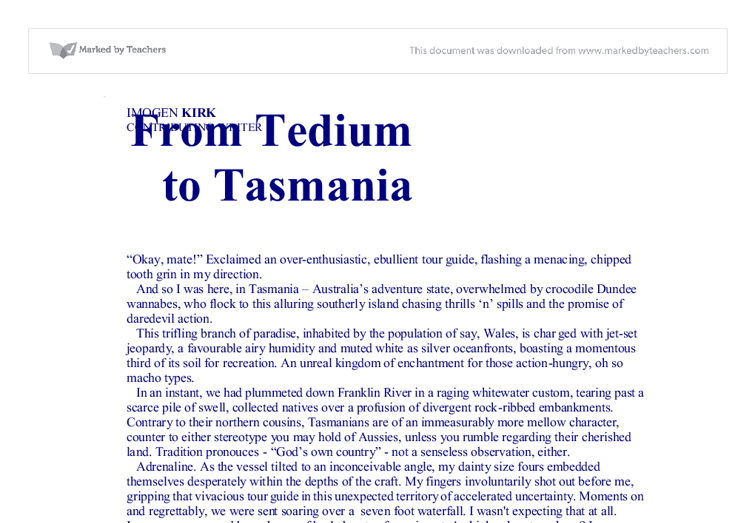 From Tedium to Tasmania -Travel- IMOGEN KIRK CONTRIBUTING WRITER "Okay, mate!" Exclaimed an over-enthusiastic, ebullient tour guide, flashing a menacing, chipped tooth grin in my direction. 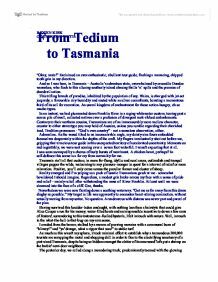 And so I was here, in Tasmania - Australia's adventure state, overwhelmed by crocodile Dundee wannabes, who flock to this alluring southerly island chasing thrills 'n' spills and the promise of daredevil action. This trifling branch of paradise, inhabited by the population of say, Wales, is charged with jet-set jeopardy, a favourable airy humidity and muted white as silver oceanfronts, boasting a momentous third of its soil for recreation. An unreal kingdom of enchantment for those action-hungry, oh so macho types. In an instant, we had plummeted down Franklin River in a raging whitewater custom, tearing past a scarce pile of swell, collected natives over a profusion of divergent rock-ribbed embankments. ...read more. Positive, you'll only come across the peculiar farmer and cluster of sheep. Reality emerged and I'm yelping as a pack of lunatic Tasmanians gawk at me - somewhat bewildered I should imagine. Regardless, a modest grin broke across my face with a sense of pride and relief - mainly relief, after withstanding the mass of River Franklin. At least until we were slammed into the face of a cliff. Gee, thanks. Nevertheless we were now floating down a soothing waterway. "Get me as far away from this damn dinghy as possible." My target in life was apparently to encounter heart-stirring commotion, without actually moving from my settee. No question. A rendezvous with distress was never part and parcel of the plan. Having survived this boulder-laden onslaught, with nothing less than a hairstyle that could give Alice Cooper a run for his money, water-filled boots and an irrepressible incentive to down a few cans of Fosters', surrendering to this testosterone-fuelled hysteria, I felt in touch with nature. ...read more. Well, I never was tall. The summit of this divine sculpture is where things really get bonkers: on any day of the year, globetrotters may stomach all four seasons in the period of one hour. If you're a Scotland aficionado, you'll love it up there. Ossa is a certain Mecca for those muscular, red-blooded types such as the leader of my group, Anthony, who marches alongside me, belching occassionally, and bellowing callow wind-related jokes. We disperse to roam a kaleidoscope of zestful luminosity and grand landscapes, man-made trails steer us past a world of fertile and cultivated territories, to petite sleepy tropical lagoons, in the space of a mere three hours' ranging - with the odd stop for a few cheeky sips of cider - Tasmania's finest, of course. Tassie's notable stretch of rugged rafting shenanigans may nauseate you to death, but its primal rainforests, reclusive shaded bays and dynamic ambience should be enough reason for you to lace up your boots and ransack this ol' cheese. ...read more. want to learn about the world and most of the news about what is happening is in English" (Elbegdorj 62). There have been attempts in America to make English the official language. So far, 27 states have approved and 8 states are considering it. "You'll never get out, wife killer!" was just one of the many vilifying insults that came his way. What happened in there could make or break him for the last time. Although somehow, he had an inclination, a proclivity of sorts that told him this was his day. She knows that I always return, and that comforts her. However, the fear and thought that I won't come back is always at the back of her mind. Sometimes I wish she could see them, my enemies. That might help her understand why have to fight them, but I know it is best that she can't. Or at least that's what it is meant to look like. I like to think every event has an effect on my life wether it be good or bad, but perceptibly the biggest event in my life must be my birth. I was born on the 27th of September 1986. The events occurring continuing in slow motion as Jade fell backwards her hair flowing in front of her face closer and closer she came to the ground. John went to his knees and held out his arms, everything now sped up to pace, bullets wising past John's head.